Book News: Tom Clancy Remembered As The Father Of A Genre : The Two-Way Also: Dave Eggers responds to allegations that he lifted another writer's work; Jim Crace on the new rules for the Man Booker prize; the problem of depicting female beauty in novels. 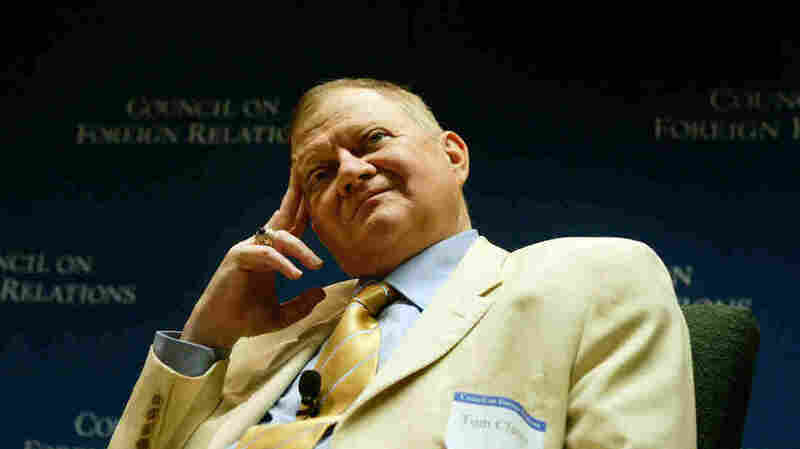 Author Tom Clancy, seen in 2004, was an insurance agent before publishing The Hunt For Red October in 1984. Tributes for writer Tom Clancy, who died on Tuesday at age 66, have poured in from other authors, who note that his fast-paced and technology-heavy thrillers redefined a genre. Bestselling author Brad Meltzer told NPR's Lynn Neary: "I, in my books, write thrillers that are full of government secrets, that are researched with people at the highest levels of that government. I wish I invented that genre. I didn't. Tom Clancy did." Meanwhile, Paranoia author Joseph Finder told Here & Now that Clancy "influenced a generation — a couple of generations — of thriller writers. He really launched the techno-thriller. Whether he invented it or not isn't important. He really created this genre, which was all about the power and the intrigue of weaponry." Or, as Clancy himself put it, "Remember, for every shot you fire, someone, somewhere, is making money." Dave Eggers has responded to Kate Losse's claim that he "ripped off" her memoir about working at Facebook for his new book, The Circle, which is also set in the tech world. In a statement emailed to various news organizations, Eggers wrote, "I want to make it clear that I have never read and have never heard of her book before today. ... Because The Circle has not been released, it's my understanding that Kate Losse has not read my novel yet, so I trust that when she does read it she'll understand that I have not read, and certainly never lifted anything from, her book." In an essay for The New Yorker's Page Turner blog, Adelle Waldman considers the problem of female beauty in novels, and argues that, unlike many other male novelists, Richard Yates and Jonathan Franzen are "clear-sighted and acute chroniclers of the male gaze." The Guardian is live-blogging the UK's National Poetry Day. Edward Mendelson makes an unexpectedly convincing comparison between Thomas Pynchon's The Crying of Lot 49 and Virginia Woolf's Mrs. Dalloway. He writes: "Like all of Virginia Woolf's novels and, despite their misplaced reputation for high-tech cleverness, all of Thomas Pynchon's novels, including his latest one, both books point toward the kind of knowledge of the inner life that only poems and novels can convey, a knowledge that eludes all other techniques of understanding, and that the bureaucratic and collective world disdains or ignores. Yet for anyone who has ever known, even in a crowded room, the solitude and darkness that Clarissa and Oedipa enter for a few moments, that experience, however brief and elusive, is 'another mode of meaning behind the obvious' and, however obscured behind corruption, lies, and chatter, 'a thing there was that mattered.' "
For The New York Times, William Grimes writes about the German crime author Jakob Arjouni: "George Bernard Shaw once remarked that there were two things that Germans have no talent for: revolution and crime novels. Jakob Arjouni proved him half wrong, at any rate." Jim Crace, whom the Evening Standard has called the favorite (I'm sorry — favourite) to win this year's Man Booker Prize, told the newspaper that, though he doesn't have a stance on whether the prize should be extended to Americans, he thinks that "as soon as you get a couple of years running in which the majority of people on that shortlist are Americans, it will seem less essential in England — and therefore they will have succeeded in turning something which is really focused and important into something that is semi-failing in two places."